Without exception, everyone I meet in the public sector wants to help make their service better. Most of them are in some way frustrated. The domain is massive and the activities disjointed. People engaged in any given service – from users and frontline workers down to managers and policymakers – can go for months on end without coming into contact with each other. On the rare occasions they do meet, they generally do so with mutual incomprehension. This is not exclusively a government problem. I know from my time as a product manager in the private sector that a similar malaise affects all big organisations. But when it happens in government the impact of poor service is graver. This is service delivered with the authority of the state. As users we cannot take our government custom elsewhere. Neither can public service providers cherry pick their customers like the private sector does. Whether we realise or not, most of government is mostly service design most of the time. If we fail to acknowledge this, we’re doomed to short change our citizens and fall short of our policy goals. But when we wake up to the potential, we find proven tools and techniques for designing service. Applying them can and should be everyone’s business. We only have to look at definitions of “government” and “service design” to find a naturally good fit. what impact all of that has in the real world and how the public and international studies rate government effectiveness. Users work their way around complex government processes, even if it means hiring costly experts like lawyers or accountants to do it for them. Frontline staff hack the process just so they can serve their customers better. Visit any contact centre to see tattered papers, sticky notes by screens, Dymo-labelled folders and trays put in place to expedite information from one part of the process to another. Good managers manage with ingenuity to sort out shift patterns, holiday rotas and flexible working so that their people can do their best work – in spite of policies and processes that treat workers more as resources than as human beings. Entire, organisations-within-organisations accrete with baroque titles such as “change management” to drive through discontinuous re-structures that fracture working relationships and frustrate any long-term organisational learning. “Policy” is a Platonic conception perceived to exist on a higher plane where users are always rational, processes run smoothly and every day is a sunny one. 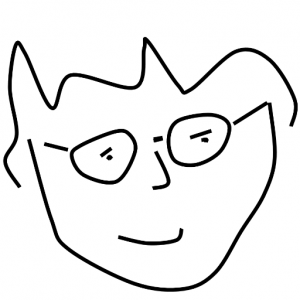 By the time we descend to the grubby depths of “implementation” it’s already too late. Our democracy itself still runs on rails laid in Victorian times, as if the population were barely literate onlookers and the parties the houses of a minor public school on a bad-tempered match day. Everywhere there are gaps. With their 1985 Gaps Model of Service Quality, Parasuraman et al. posited 5 types of them. Let’s look at those gaps again. Gap between what customers expect and what managers think they expect. We seek and expose user insights, not just at the start or end of the process, but throughout. There’s good evidence that everyone on the team should spend at least 2 hours every 6 weeks observing primary, qualitative research. How about we make that a prerequisite for Permanent Secretaries, council CEOs, and everyone else not in direct day-to-day contact with service users? 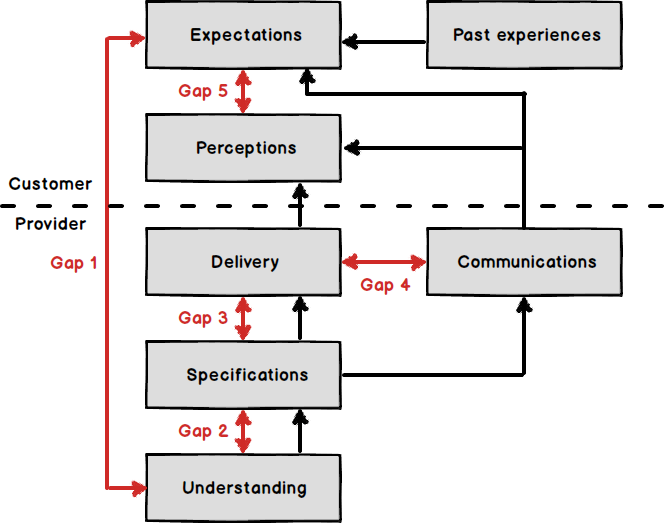 Gap between management perception and service specification. Even when we understand what users need, we have to get better at translating that insight into a vision of the service. We can use powerful formats such as user stories to tie requirements back to users and their goals. The best specifications of all can be real working prototypes. Making prototypes is easier than ever. Gap between specification and delivery. Alpha and beta versions are what we use to close this gap. They help us understand the ins and outs of delivery even as we refine our designs. Gap between what customers expect of service and how they actually perceive it. This yawning chasm is the cumulative effect of gaps 1 to 4. It is also the main driver of disappointment and distrust in public services. One bad experience loops back round and poisons our expectations of future interactions with government – a downward spiral that we need to disrupt. How can we make government better? By accepting that first and foremost everyone’s a designer, and that we all need to develop a design thinking sensibility. Service design is visual. This doesn’t mean you have to be great at drawing – but it does demand working with more than words. When we draw pictures and diagrams we engage a different part of our brains and spot things we would miss through written specification alone. Making those assets visible can feel scary at first. That’s worth it though, because they change the conversation into something much more constructive than any amount of finessing verbal positions and semantics. Service design is multidisciplinary. ISO 9241-210, the international standard for human-centred design acknowledges that no one discipline has a monopoly on design. Rather, “the design team includes multidisciplinary skills and perspectives.” This is a challenge to a silo-ed way of working, but small “two-pizza” teams in startups and internet giants like Amazon and Google prove it can be done. Service design is holistic and integrative. Good designers of any stripe look at the big picture – what is the user need? what is the policy intent? – but they don’t stop there. They also dive down into the details and forge novel combinations of components. They hold multiple, potentially contradictory, strands in tension, zooming in and out between the reasons for doing something and the details of delivery that will make it succeed. Service design is iterative. Whenever I read an account of Apple’s development process I am struck by the number of versions and iterations their products and services go through. They create and test many ideas before narrowing down on a handful to develop further. Just at the point when lesser companies would settle and launch they throw all the cards in the air and create yet more new combinations. Finally, service design treats time as a material. There’s a place for thinking and working fast, and one for being slow and considered. A food bank user needs assistance before the next mealtime while a retiree of 60 needs to think what money they might need aged 100. 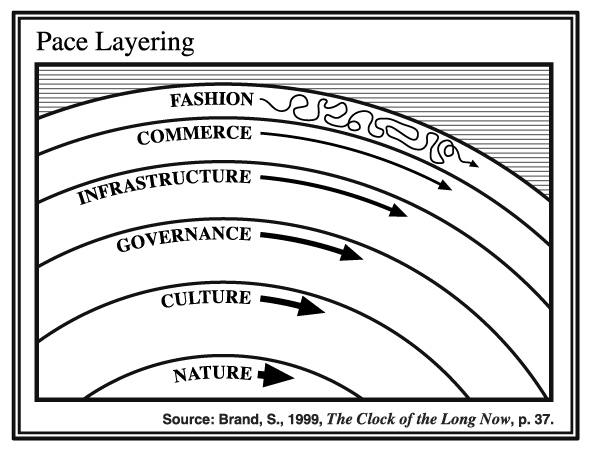 Big service providers get stuck too easily in the middle of Stewart Brand’s pace layers. Service design helps them to be more supple. Don’t believe me? Try this stuff out for yourself. In June I’m taking part in the Global GovJam. It’s not a ‘designers’ event, just people designing together. For 48 hours we break down silos between local and national government, the NHS and social care, public, private and third sectors. We challenge people to communicate their ideas through doing, not talking. They make prototypes and take them out to potential users when they still feel incomplete. And the buzz as people realise how much they can achieve in so little time is amazing. Come and join us in Leeds or in dozens of other cities around the world.